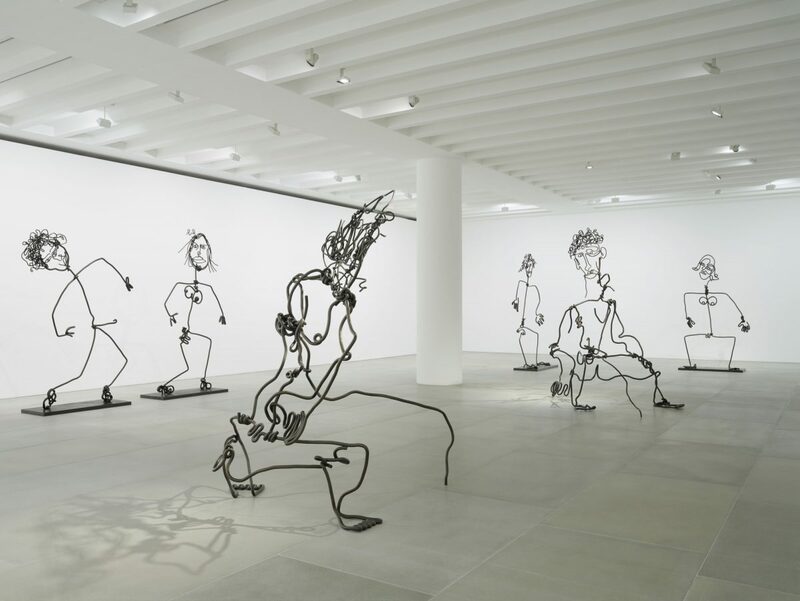 Tim Noble and Sue Webster return to Blain|Southern London to present a new body of sculptural works. 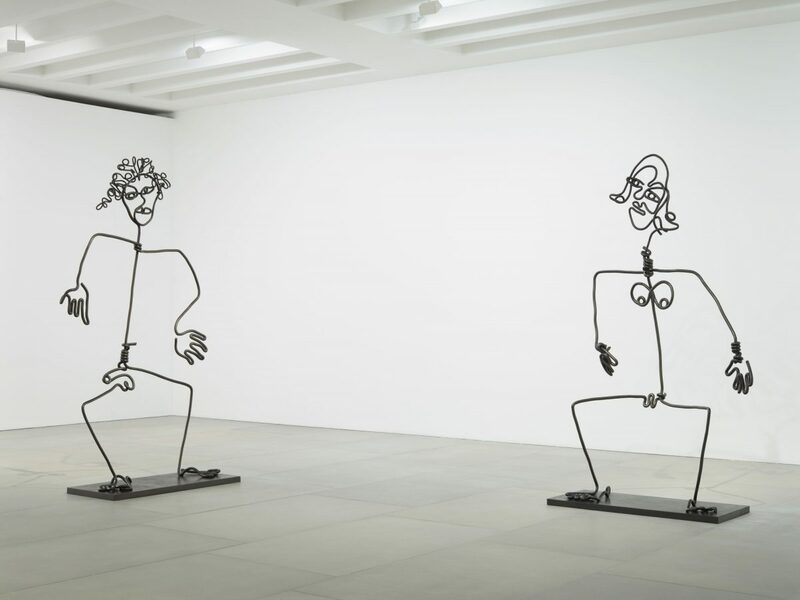 In their third exhibition with the gallery, STICKS WITH DICKS AND SLITS, the duo present pairs of giant self-portraits. 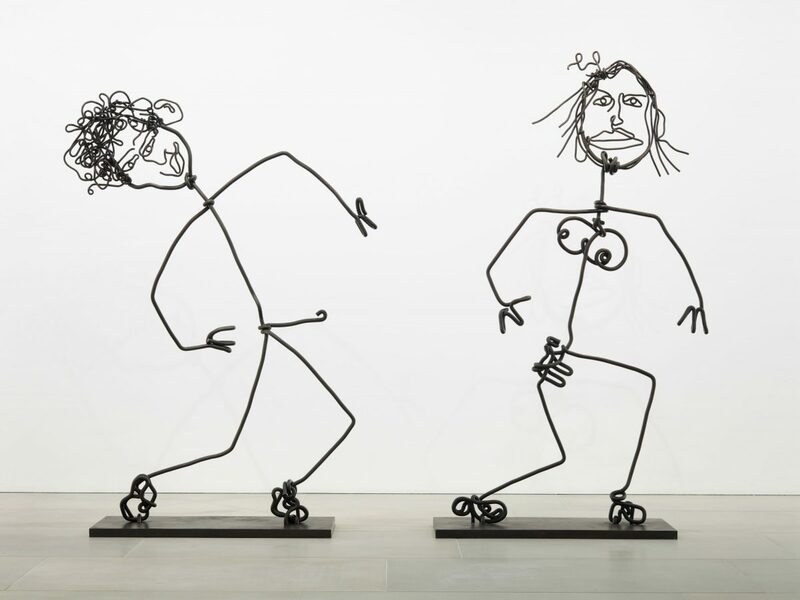 These stick figures are sculpted in twisted bronze, an entirely new method for the artists. 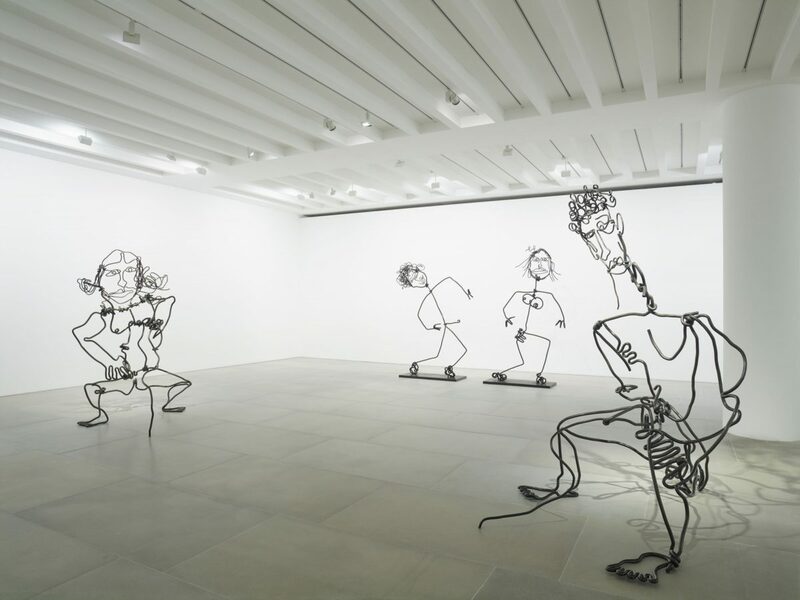 Based on handmade maquettes made with electrical wire, the sculptures are an act of upscaling playful ephemera into physically domineering artworks with a permanency and scale that transcends human limitations. The artists are well known for reacting to circumstance. They find inspiration by walking city streets and making sculpture from materials closest to hand in an urban environment. In the past this has included inner city detritus, discarded personal objects and animal carcasses. However, the initial maquettes for this new body of work were created during a residency on the Caribbean island of St Bart’s. This idyllic environment was initially challenging for these urbanites who found themselves stripped of their usual impetus. Struggling with this creative impasse, they began doodling with electrical wire, quickly and intuitively producing two intimate self-portraits. Part of a great tradition of artists-as-art, their personal image and the dynamic between them is an integral part of their work. As with previous self-portraits, these new paired sculptures express the artistic personae of the duo. One pair features nudes of Tim urinating and Sue lactating — engaging in basic bodily functions is a recurring motif for the artists. As much as they have used refuse in their sculptures, the artists employ their own naked forms as a way to make art with a rawness and truth, using their warts-and-all inseparable dual image as a tool to critique narcissistic obsession. As with the punk and 2 Tone bands who had such an effect on the artists, what defines this duo is a drive to convey a particularly British ‘kitchen sink’ reality, pushing against the polished veneer of the presiding culture. Their systems of imagery, language and material are as confrontational as early punk gigs where both critique and praise were delivered through bodily fluids. As with this music, the artists play with the tensions of structure and form, purposefully teetering on the edge of chaos. 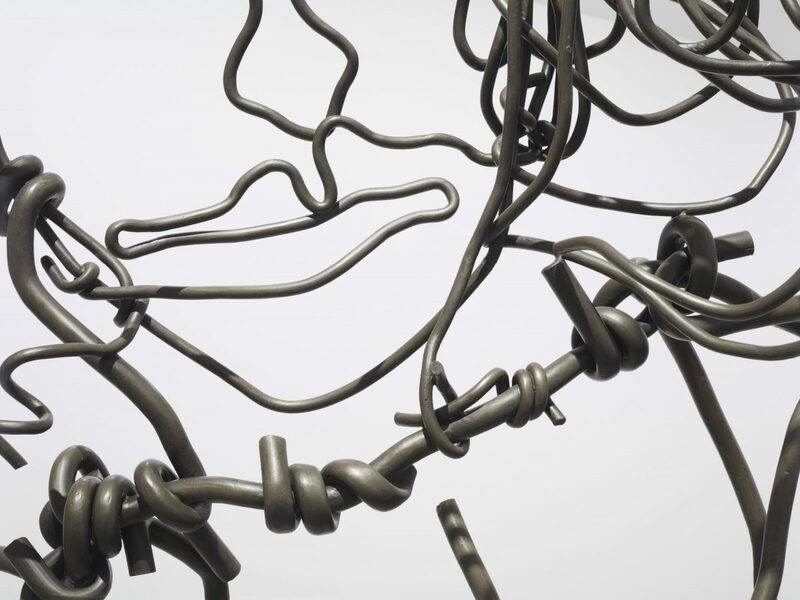 The size, medium and aesthetic of their new sculptures are yet another bold development in a practice that Noble describes as ‘consistently inconsistent.’ Working at a scale that seems to contradict the materials, the artists achieve the sketchy, continuous effect of wire by employing the traditional technique of lost wax casting. 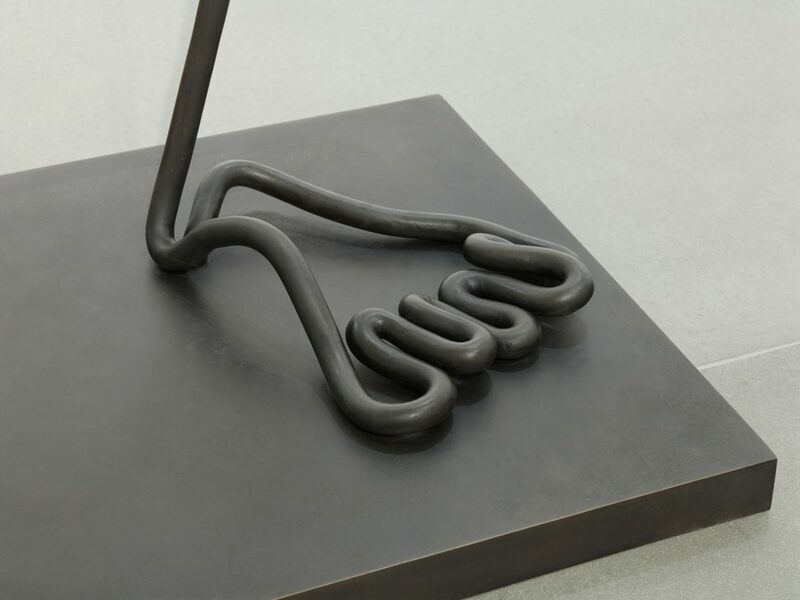 The technique involves manipulating and casting rods of wax, before pouring molten metal into cavities to recreate the final sculpture in bronze. The resulting casts retain the spontaneity of the sculptor’s hands, and remain humanised and true to the subject. The dimensional qualities vary between each pair yet they are united by a fluidity and lightness of gesture that is rare to see in large-scale sculpture.